Here's another author who needs little introduction on this blog, and one I'm very pleased to return to. 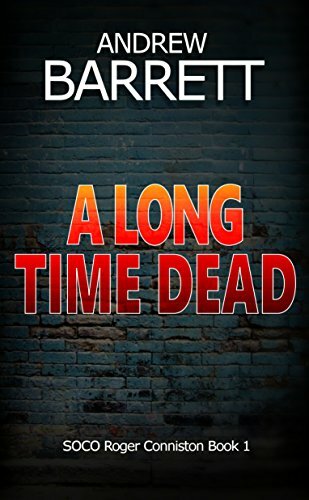 With most of his books registering around a 2.5 on the Conyngham Scale (that is, closer to noir than to cosy), it won't surprise you to find that the author is an experienced CSI himself in Yorkshire where the books are set, and the main characters of two of his series, Roger Conniston in The Dead trilogy and Eddie Collins (oh, poor Eddie - what he puts himself through!) in, for example, Black by Rose. But it's not just blood and gore: these thrillers are both action-packed and decent brainwork, with convoluted plots that all come together nicely in the end, even if the main characters are not always happy. And the authenticity of the forensic investigation - even if Eddie pulls it out of shape - shines through. There are plenty of books in the Andrew Barrett canon - it's well worth starting each series at the beginning and working through. It won't take you as long as you'd like, but there'll be more on the way! Stop Press: Bloodhound Books have just announced that they've signed Andy for his Eddie Collins books, so if you want to be a purist and only read indie, you'll have to stick with Roger Conniston. But I'd recommend both. I'm not supposed to be writing the first book in the next series until April, but somehow I'm just starting Chapter Five! Completely incorrigible. And here's the reveal - it's to be called Tomb for an Eagle. Mailing list people will be getting a Murray novella along with their March newsletter. It's set in Scoggie Castle not long after Murray's appointment to tutor the young Scoggie boys. More information to follow! If you're interested and you haven't yet bought Jail Fever, it's 99p on Amazon from today till next Thursday, 22nd. If you like it, leave a review!